Once someone went to a sufi master who at that time was listening to a sufi sama (mystical music that connects to divine) in an absorbed state. Seeing the sufi master in such a state made the visitor surprised. She knew at that moment that the master was not here, he was literally lost. Feeling the presence of the visitor, the master told her, sit here my daughter and listen three sixty. What he meant was an invitation for listening with whole being. Listening three sixty is not merely listening but being absorbed, being totally immersed into the depth of the verses, in the tune, rhythms, vibrations. It triggers contemplative mood and deep state of meditation. 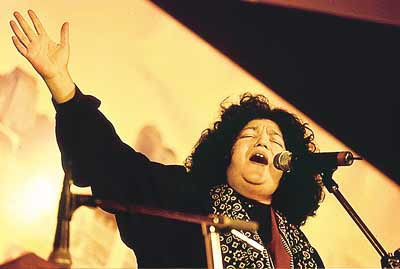 Abida Parveen is a contemporary sufi singer who has the capability to draw her listeners into that sacred space where one listens 360. Only then at once some magic happens. Heart awakens, strange joy rushes in through the veins, sweet pain of separation comes alive, tears well in eyes and ultimately we feel the presence of the Unknown. Here i offer one of such song by Abida Parveen with meaning of each verse. Listen 360 and get connected. Humans know to the confines of their finite mind. - and where it ends. the desolation of my heart. Only He knows the expanse of the hearts universe. Whatever there is in the world, is the story of our love. I was lost to the world. Ki yeh rangeen bayani Bedam rangeen bayan tak hai.